New Delhi: The University of Sydney, Australia’s premier higher education and research university, has capped off a roadshow covering Mumbai, Delhi and Hyderabad to announce an India-focussed scholarship program worth more than INR 25 million accompanied by partnerships with Tata Institute of Social Sciences (TISS), Tech Mahindra and the Indian Institute of Technology (IIT) Bombay. The University of Sydney’s TISS partnership will look at real-world projects, developed and managed by both universities’ academic staff—focusing on economic development, environmental sustainability and social inequality. 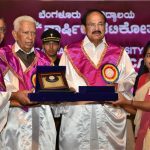 It will build on initiatives currently in place and include tailored classes and city field visits in Mumbai as well as travel around the Southern State of Kerala. With Tech Mahindra, the university has signed a Memorandum of Understanding (MoU) aimed at allowing student groups to work with an academic supervisor and industry experts on problems around artificial intelligence (AI), machine learning, virtual reality, augmented reality, and the Internet-of-Things (IoT) in Tech Mahindra’s Makers lab. TISS, Tech Mahindra and IIT Bombay join the Indian Institute of Technology – Madras as strategic partners of the University of Sydney. Next articleImperial College Business School has announced the appointment of a new Executive Director for Marketing, Recruitment and Admissions.